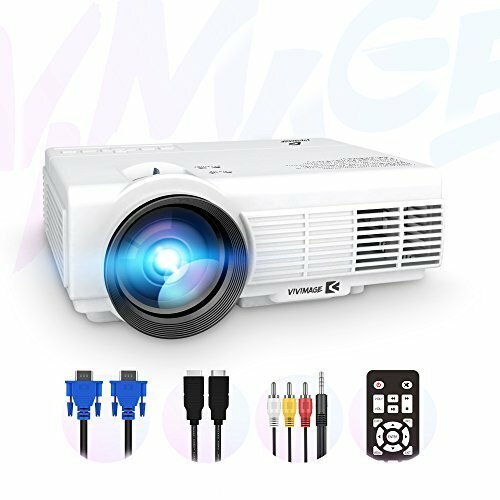  Brilliant Visual Experience: VIVIMAGE C3 Projector is Equipped with upgraded LCD and 20%+ brightness than similar model on market to deliver premium picture and more expansive color for a cinematic viewing experience. 40,000 hours Lamp lifetime to ensure your enjoyment lasting. Multimedia Portable Projector: Portable size of L/7.83"&W/6.41" like iPad mini; Compatible with TVBOX, Fire TV Stick, PS4, PCS, Tablets, Smart Phones,( Wireless HDMI Dongle not included); HDMI/VGA/USB/AV connection supported&cables provided; Interface for TF card/Hard disk/audio; PPT/Office Presentation Not Recommended.  Optional Projection Models: 1080P,720P,480P supported; Aspect Ratio: 4:3/16:9; Contrast Ratio: 2000:1; Adjustable watching size 32-170 inches with project distance 3.7ft-19.5ft; ±15°keystone support. Your eyes will be pulled into a pure viewing experience at your wish.  Best Choice for exclusive entertainment: Less than 2lbs and high quality speaker built-in, you can always bring this mini projector along and dress any space oasis for movies, concert, games,etc for personal surfing or family/friends gathering. Be the commander of your home theater.  3-YEAR TRUSTY WARRANTY: VIVIMAGE offers our customers a 3-year 100% Money Back Guarantee and professional customer service & technical support. We are ready to help if any question or problem about VIVIMAGE products. If you have any questions about this product by VIVIMAGE, contact us by completing and submitting the form below. If you are looking for a specif part number, please include it with your message.